Many EPROM programmers that you see on fleabay are USB based. That presents a problem to those of us using Micro Channel systems, where we cannot keep up with the dizzying update path which requires new equipment and new software... The beauty of the Needham Electronics EMP series is the device related processing is dome within the programmer itself. The parallel port based programmer is relatively immune from the upgrade issues of more modern programmers. Modern systems can lack any parallel ports, can lack expansion slots, or the O/S can lack support for the I/O addresses needed by a real parallel port. Got your supply of PCI or PCIe parallel port cards? YMMD. 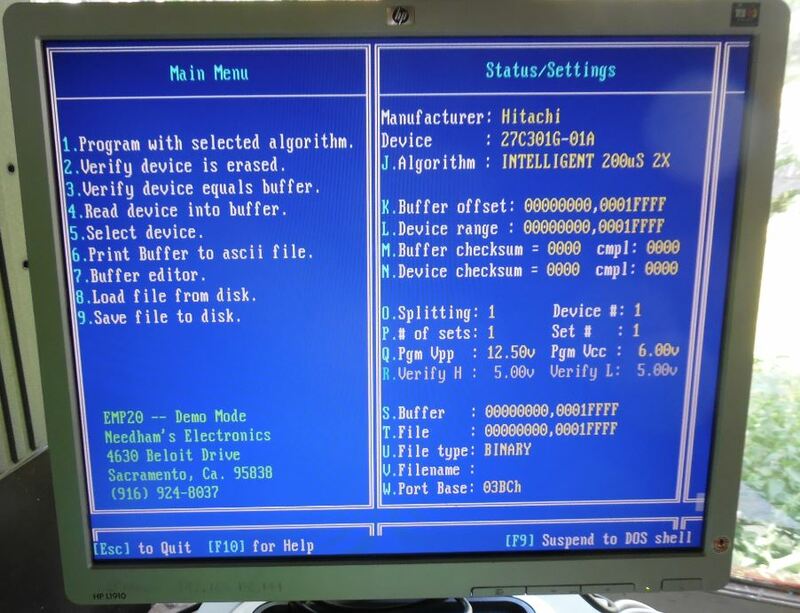 NOTE: When using the DOS version of EMP software on Windows 95 or 98, reboot windows and press F8 during boot-up. 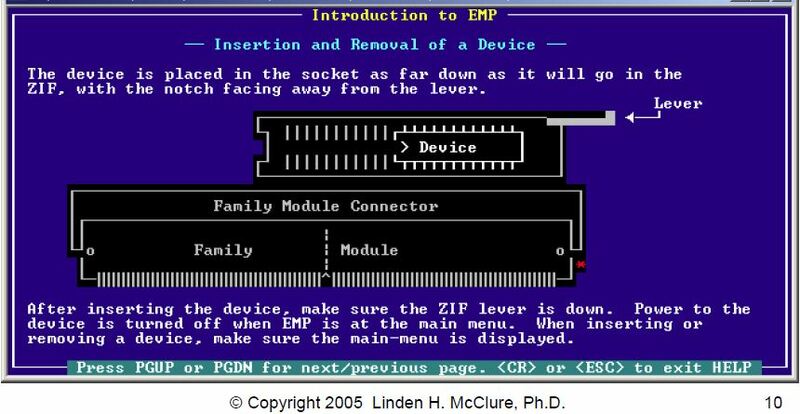 This will take you to the "Safe Mode" menu where you can then select "Safe Mode Command Prompt Only" then run the DOS version of EMP from there. NOTE: The DOS software is not guaranteed to work with NT/2000/XP. Communication problems may arise when using DOS parallel port applications within the Windows environment. Download and install the windows NT/2000/XP driver update (EMPNT.EXE). The DOS software must be run in full screen mode, this can be achieved be pressing ALT-Enter when the EMP startup screen appears. 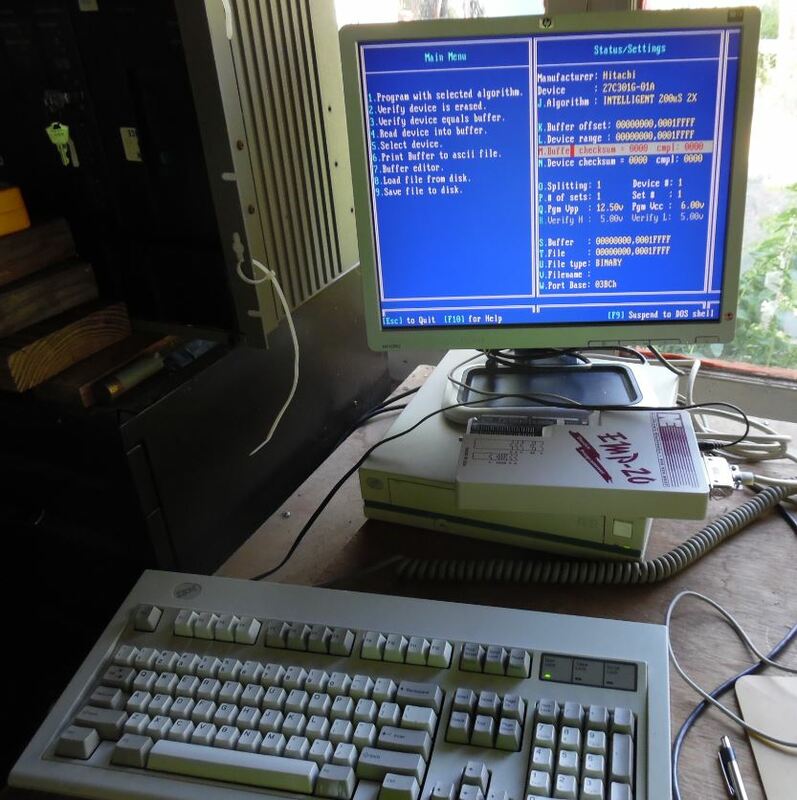 Try an older system with a DOS based operating system (WIN 3.1/95/98/ME) and a processor below 800 MHz. Why does the device checksum keep changing? This happens with the DOS software. Increase the parallel port timing. The port timing can be changed in the software by pressing Control-P while in the main menu screen. This will prompt you to enter the “in“ and “out” delay times. Set the delay times to the slowest speed (longest delay) of 255. To increment the delay press F1. To decrement the delay press F2. To scroll through the different delay times use the up/down arrows. Once the correct port times are input press enter to save the settings. This is a significant bit of information. I recently fired up my EMP-20, and the buffer was coming up empty, all ASCII 255... So I looked at the image silk screened on top of the EMP-20... It shows the square end of the device towards the side of the EMP-20. 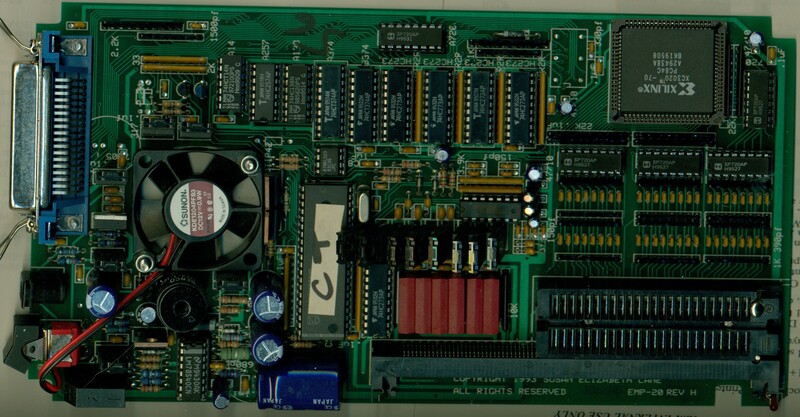 There are multiple outlines of the notched end (at each length, like 20, 22, 24, 26...) towards the top (the end of the EMP-20 with the parallel port). Thankfully, it is a pretty simple menu. "5" brings up a list of manufacturers (Select Device) , and once you choose one, another list of supported devices pops up. This list of supported devices also has the associated Family Module identified. The Family Module is identified when you choose the device under "5. Select Device" AND it is also identified on the Main Menu page on the right side under "Status / Settings" > "Device" and you will see 27C301G-01A. The "-01A" is the Family Module that you need. You may notice "EMP20 -- Demo Mode", I didn't have the EMP-20 attached at the time. Saving a ROM image is a two step process. Hit "V"(Filename) to type in the filename. You can add a specific path if you want the file in a location other than the software directory. Reseated all the socketed ICs. They had a little creep over the years. What kind of power supply does the EMP series programmer require? A wall transformer 12V AC or 15V DC. I have an EMP-11, which I believe uses the same power supply as the EMP-10. My supply is rated at 12 VAC, 1000 mA. Yes, it says AC, not DC, which might make finding a replacement a little tricky. My EMP-10 uses a Condor too. It uses a Sunon KDE1204PFB3, DC12V 0.9W fan.